Staying up to date in this modern world is quite challenging. The landscape of technology is expanding its wings and has become a huge part of our lifestyle over time. These Smart devices including our phone, TV, Refrigerator, wristwatch are an integral part of our life and get us through our day. Well, big thanks to Artificial Intelligence (AI) which has made it very much possible. Every device and every system we use gets smarter every day and it’s really important to keep up with them. So have you bought the New 4K TV this Black Friday or Cyber Monday? Here’s a quick guide to set it up. Apple 4K TV (179$): If you’re crazy about Apple products then this might be a perfect pick. It streams high quality video and audio as well as UHD movies in the iTunes store for $5.99 to rent or $19.99 to buy. Roku Ultra (99$): Roku Ultra along with a Streaming Stick will fall perfectly in your budget. If you’re looking forward for an Ethernet jack and USB Port then Roku won’t disappoint you. Google Chromecast Ultra (54$): If you love to watch a lot of YouTube content on your Smart TV then Google Chromecast is an apt choice. You can also use it for displaying high resolution photos or videos on the big screen. Amazon Fire TV 4K (69$): This is one fairly awesome low budget choice for your Smart TV. Overall it is a full Smart TV suite that’ll feature all kinds of movies and games. These are just a few options! The market is flooded with a myriad of options, so you can pick any gadget of your choice. 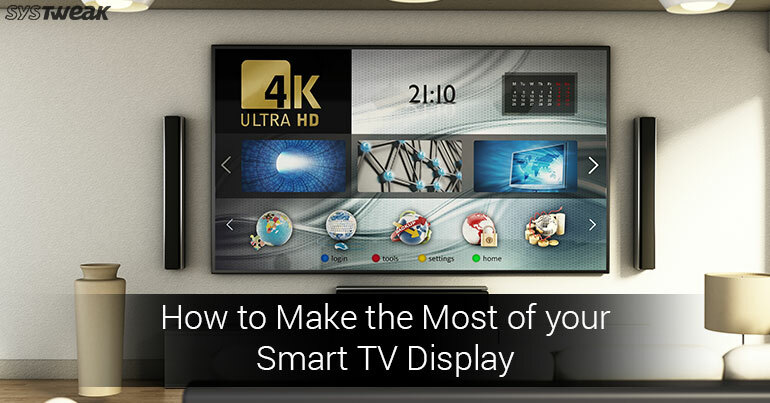 Now that you have your dream TV with you, here is what you need to do! Love it or hate it but without a high-speed Internet, your Smart TV will just look dumb. Before you plan on buying a Smart TV just make sure your upgrade your current Internet data plan from your network subscriber. If you want your Smart TV to stream in ultra HD definition then make sure you have a data plan that supports minimum of 25 MBPS speed. If you’re not willing to hinder your Smart TV experience after spending a fortune then make sure you place it ideally at the right spot. You should pick a convenient spot to place the Television and couch, somewhat which is not too far or too close from eyes. Technically, a viewing angle of 40 degree (or less) is recommended by experts. If you want your 4K TV to stream in the best possible manner then pick a suitable HDMI Port. Try and go through the manual once before your start plugging the HDMI cable in the wrong ports. So far so good! So, now you’ve successfully set up your new Television set on the wall and picture is looking good. What next? The next step, once you’re done setting up the TV is to customize the display settings as per room lighting. You can increase or decrease the color, brightness, contrast levels to make the picture look more vibrant and lifelike. If your TV has a fancy new high-dynamic range mode we recommend you to use it. You will not like to watch TV in any other mode after that. So, fellas, here were a few points to keep in mind while setting up your new 4K Smart TV. We hope these basic tips help you make the most of your 4K TV.